Los Angeles D.A. Rachel Knight faces down the murderously ambitious side of Hollywood in Marcia Clark's newest thriller. When the daughter of a billionaire Hollywood director is found murdered after what appears to be a kidnapping gone wrong, Los Angeles Special Trials prosecutor Rachel Knight and Detective Bailey Keller find themselves at the epicenter of a combustible and high-profile court case. Then a prime suspect is revealed to be one of Hollywood's most popular and powerful talent managers--and best friend to the victim's father. With the director vouching for the manager's innocence, the Hollywood media machine commences an all-out war designed to discredit both Rachel and her case. 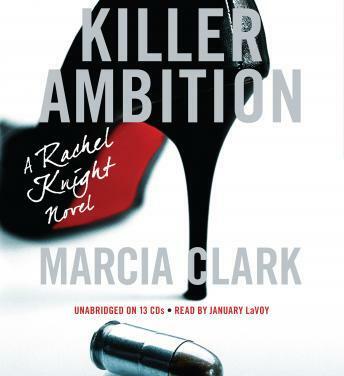 Killer Ambition is at once a thrilling ride through the darker side of Tinseltown and a stunning courtroom drama with the brilliant insider's perspective that Marcia Clark is uniquely qualified to give. This book is long but I really enjoyed the story. I love the details Marcia clark puts into her books and the subtle sarcastic notes. The narration is well done. I enjoy listening to anything January LaVoy reads.